Here is your chance to speak up for the health of our marine ecosystem and favorite striped bass food! We need to make sure that the harvest levels remain the same and NOT increased so that a few may profit! The Atlantic States Marine Fisheries Commission (ASMFC) is seeking public comment on its plans to make changes to its American Eel Fishery Management Plan (FMP) for commercial yellow and glass/elver eel allocation and management. This is an important opportunity for the public to ask for increased eel conservation. By entering your information we will send a letter to your appropriate representative in support of increased eel conservation. You will receive a copy of this conversation and a copy of the letter sent via email. Please share with a friend. We only have until June 15, 2018 to make our voice heard. RETURN TO OUR HOMEPAGE AND LOOK FOR THE EEL IN THE LOWER LEFT HAND CORNER. THE FOLLOWING LETTER WILL BE SENT TO THE ASMFC ON YOUR BEHALF. According to the U.S Fish and Wildlife Service, in all its life stages, the American eel serves as an important prey species for many fish, aquatic mammals, and fish-eating birds. Climate change may affect future ocean conditions, such as water temperature, current patterns and food sources that may have implications for the eels breeding success. However, high levels of uncertainty in the precise mechanism and timing of such changes make it difficult for scientists to accurately predict how, or to what extent, any changes will affect eel migration, aggregation for reproduction, and ultimately abundance. According to the ASMFC, The goal of the current American Eel FMP is to conserve and protect the American eel resource to ensure its continued role in its ecosystems. This FMP requires that states and jurisdictions maintain existing or more conservative American eel commercial fishery regulations for all life stages, including minimum size limits. Each state is responsible for implementing management measures within its jurisdiction to ensure the sustainability of its American eel population. However, the 2012 benchmark stock assessment results indicated that the American eel stock had declined, that there were significant downward trends in multiple surveys across the coast, and that the stock was depleted. And, the 2017 assessment update repeated the 2012 finding that the American eel population is depleted. In addition to the depleted stock status, the total coast wide yellow eel landings from 2011-2016 exceeded the coast wide cap in 5 out of 6 years. And, there are significant uncertainties in the commercial landings data because not all states comply with the required data reporting, and there are potential biases present in the commercial yellow eel data set because even with mandatory reporting, requirements do not always extend outside marine districts where yellow eel are harvested from non-marine waters, and misreporting between conger eel, hagfish, slime eel, and American eel has been known to occur. 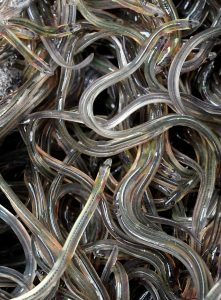 Regarding the current elver harvest, given an estimated 2,000 elvers per pound, the current Maine quota of 9,688 pounds combined with the 15 states aquaculture quota of 200 pounds each would yield a total coast wide quota of 12,688 pounds, or a potential to remove 25,376,000 eels from the water, in addition to the total yellow ells removed under the current coast wide quota of 907,671 pounds. 3.1 Proposed Options for Maine Glass Eel Quota: Option 1: Status Quo Quota for Maine of 9,688 pounds of glass eel. 3.2 Proposed Options of Glass Eel Aquaculture Plans: Option 1: Status Quo. Issue 1: Coast wide Cap: Option 4: Coast wide Cap set at 836,969 pounds; a 12% decrease from the mean or average of 1998-2016 landings. Issue 2: Management Trigger: Option 1: Status QuoThere are also numerous allocation options in Addendum V, but the main options to maintain or increase protections for American Eel are the ones noted above. Thank you for the opportunity for concerned anglers like me to submit comment! Your contact info will go here.